Watch us share our favorite books for teens! 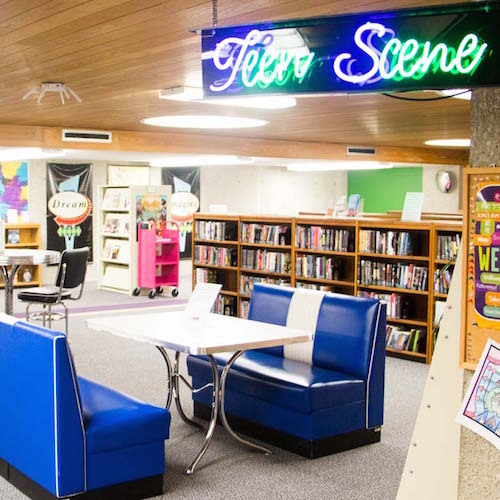 Any library patron may use the Teen Scene collection, but the furniture is reserved for students going into grades 6-12. The computers can only be logged onto with New Albany-Floyd County Public Library young adult library cards. Teen Anime Club generally meets on the last Wednesday of the month from 5:30 PM – 7:00 PM, in the library’s auditorium. Each month interested teens make a craft or activity inspired by anime or Japanese culture, discuss their favorite anime and manga, and watch a few episodes of a voted-upon anime. Teen Game Night takes place the first Monday of every month. Join us for Teen Game Night – the ever-changing monthly gaming program for teens and tweens. For grades 6-12. No registration required.